In December 2014, California's Oakland City Council passed an ordinance that will ban the use of bullhooks and other cruel devices on elephants in circuses and traveling shows. This includes bats, axe handles, pitchforks and other implements designed to inflict pain for the purpose of training and controlling the behavior of elephants. Supporters of the ordinance included the Performing Animal Welfare Society (PAWS), national animal protection organizations, local advocates, and the Oakland Zoo. For all the following reasons this victory was really sweet. But maybe most important is what this vote portends: a shift in societal values that rejects the cruel treatment of animals, especially for frivolous "entertainment." Clearly, we are at the beginning of the end of the age of performing wild animals. 1. The bullhook ban in Oakland makes one less city where elephants will be abused with this cruel weapon. The bullhook is a menacing weapon resembling a fireplace poker, with a sharp tip and hook at the end. It is used to forcefully prod, hook and strike elephants in order to dominate and control them, and to make them perform on cue. Elephants in circuses live under the constant threat of the bullhook from the day they are separated from their mothers as calves until the end of their lives. 2. Oakland is the second major U.S. city to ban the bullhook. Los Angeles banned the bullhook in 2013. Each of these cities will be phasing in the bans (they both go into effect in 2017). Oakland and Los Angeles are the only cities with circus-related bans where the largest circuses perform. 3. Circus industry bully tactics backfired. In Los Angeles and Oakland, circuses threatened to pull their shows and other productions, a bully tactic aimed at vulnerable arena workers. Both cities opted to protect elephants and workers by phasing in the bans. Los Angeles and Oakland have regulations in place that allow for inspections of the elephants and other animals in circuses in the meantime. 4. Circus attempt at "grey-washing" went nowhere. Like corporations that use greenwashing to improve their image with the public, circuses use "grey-washing," making claims that they help elephants in the wild. In Oakland, no one bought the idea that seeing elephants perform ridiculous tricks has anything to do with protecting elephants. Any claims made by circuses to "conserve" elephants are clearly done with their own interests in mind, and that's to keep elephants in circuses for "entertainment" and profit, no matter the cost to the animals. 5. Bullhook users were not credible. Elephant handlers from circuses and from an Association of Zoos and Aquariums (AZA) accredited zoo that still uses bullhooks insisted that their relationships with elephants are based on "trust" and "mutual respect" – despite the fact that the elephants they manage have no choice but to comply with commands or face the consequence of painful punishment. Their claims rang hollow in the face of video evidence showing the use of the bullhook to hurt, bully and intimate elephants. 6. Community values trumped cruelty for profit. It is no longer circuses versus animal rights activists: The clash is between community values and the cruelty inherent in forcing elephants to perform for the public. Oakland Councilmember Noel Gallo stated: "If you stop and think about it – it is cruelty – and it's a sign of our values." 7. Media coverage of the Oakland ban educated the public. The Oakland ban provided even more fuel for a public that increasingly cares about and condemns the cruel treatment of animals. 8. It's a sign of the times. The writing is on the wall. Circuses must adapt to modern sensibilities – meaning no more cruel and archaic wild animal acts – or see their attendance further decline. 9. The ban provides one more reason why all zoos should rid themselves of the bullhook and distance themselves from the circus industry. 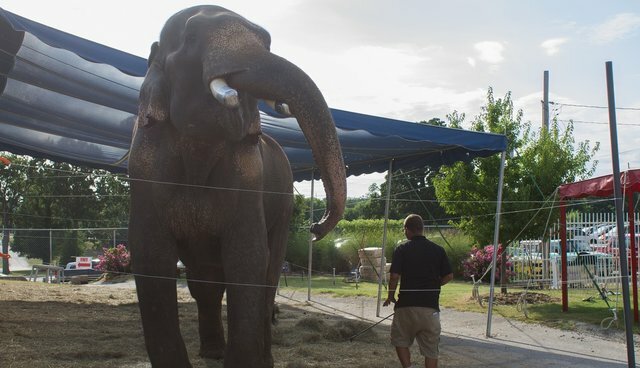 Progressive zoos have rejected the bullhook for safety and welfare reasons, but several accredited zoos continue to use this cruel device to manage elephants. This includes the Oregon Zoo, Houston Zoo, Wildlife Safari (whose keeper defended use of the bullhook at the Oakland City Council meeting), and others. Defending inhumane training and maintaining close ties with circuses undermines zoos' claims to put animal welfare first. 10. The Oakland and Los Angeles bullhook bans send a message to other cities, counties and states that they also can also protect elephants and other animals forced to perform in circuses. More than 40 U.S. municipalities have enacted prohibitions, including bans on bullhooks and on the use of wild animals in circuses, and more are considering action. About 30 countries around the world have passed some form of restriction on the use of animals in circuses; Mexico and the Netherlands recently passed bans on all performing wild animals. If you would like to help elephants and other animals in circuses that perform in your community, contact Catherine Doyle at the Performing Animal Welfare Society (PAWS) at cdoyle@pawsweb.org.